Summer has created a magical mermaid world, with My Mermaid Lagoon. Summer loves doing anything arts and crafts, I knew she would love this set from Interplay. 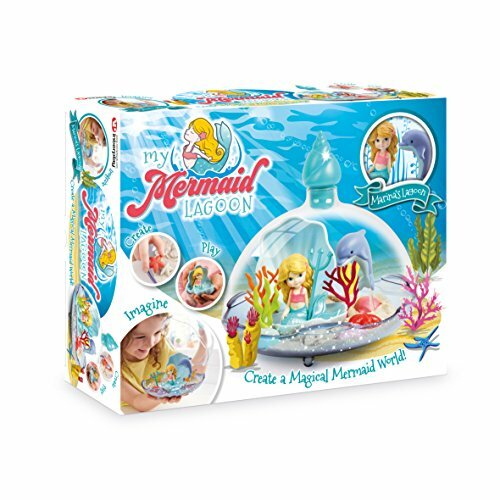 With My Mermaid Lagoon, you can create many different Lagoon settings for your mermaid. All done in the display bottle, which is also perfect for displaying your magical mermaid world on the shelf. With the glittery play sand, you can mold, sculpt and play. As well as the mermaid and her friend the seahorse, there are lots of accessories included: coral, clamshell, and rocks. Summer's played with her My Mermaid Lagoon quite a few times, she loves changing the accessories around and playing with her little mermaid. She also proudly displays in the living room. It's not messy at all, the sand is quite doughy and molds together very well. There are 3 sets to collect, I'll definitely be buying Summer the other 2 sets for Christmas. Aimed at children aged 4+ and RRP of 16.99.